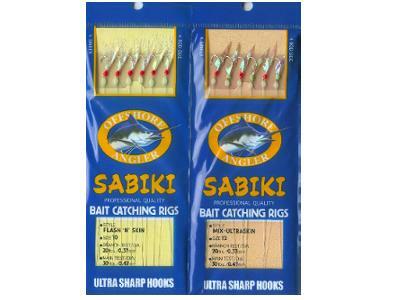 Bait Catching Sabiki Rigs by Offshore Angler for catching mackerel and sardines caballito smelt herring to name a few when you come across a school of bait in the water on your hunt for the big one. You may want to get a few of the local baitfish in case you run across a good kelp paddy or debris in the water holding dorado tuna or yellowtail to name a few. At times the local fish want the bait from the area and are difficult to get to bite the artificials. These bait catching rigs can help get the bait from the ocean to the bait tanks in no time at all. Six hooks in 2 sizes and styles to choose from for the mackerel to the sardines these are you ticket to success. These help get the job done quick and then it's off to fishing again. Size #10 has green glow in the dark beads and flash "n" skin 30 lb mainline and 20 lb branch line 6 hook rig. Size #12 has glow in the dark head only and mix ultraskin 30 lb mainline and 20 lb branch line 6 hook rig both red and green glow beads. All have ultra sharp hooks. Jan 29, 2003 RickM I have caught smelt herring mackerel anchovies pargo blue perch blacksmith perch and even a bonita with these sabiki rigs. I have even cut them in half to make them last even longer and I am telling you for the price they can not be beat. Thanks you guy's your the best!